Our TMD treatment is one of a kind. Your temporomandibular joint (TMJ) connects your lower jawbone to your skull. These joints get a full workout every day while you speak, chew, swallow and yawn. If you manage to injure your jaw, TMJ, or certain muscles in your head and neck, you can develop what’s known as Temporomandibular Disorder (TMD). Habitual grinding/clenching of your teeth (this exerts a lot of pressure on the TMJ). Accidents involving whiplash or impact to your facial region and damage muscles or joints. A dislocation of the soft cushions or disc between the ball and socket of your jaw. 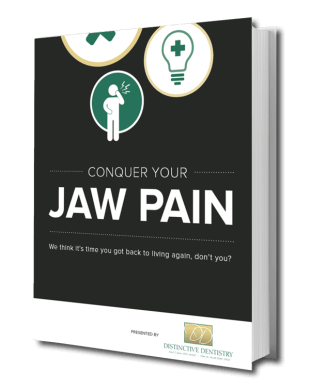 Stress that causes your facial and jaw muscles to tighten for extended periods. TMD Symptoms Addressed Sooner, Fair Better! Pain or muscle spasms in your jaw area. Frequent headaches or neck aches. Clicking or popping sounds when your jaw moves. A locked jaw or inability to completely open your mouth. Pain, ringing, or “stuffiness” in your ears. An uncomfortable bite, as if your teeth aren’t aligned properly. At our office in North Jersey, TMD starts with a thorough assessment of your temporomandibular joint. Our advanced K7 evaluation system enables three crucial measurements. The first is a scanner that measures the movement of your jaw in three dimensions and also the speed at which it opens and closes; the second records the electrical impulses emitted by your jaw muscles; and the third analyzes clicking and grinding sounds from your TMJ. This gives Dr. Martin sufficient data to diagnose TMD and form your treatment plan. TENS—this treatment uses low-level electrical currents to relax the jaw joint and specific facial muscles, providing pain relief. Wear a splint or night guard—it fits over your teeth in a way designed to prevent your upper and lower teeth from grinding and traumatizing your muscles. Corrective dental treatments—in some cases, the careful placement of a crown or another dental restoration can balance a problematic bite. Trigger-point injections—Botox can sometimes be injected into a tender facial muscle to relieve pain. As a patient who has not been to a dentist for many years, I felt comfortable, safe and pain-free. The team made me feel very good about my visit and was very helpful and informative. I will return. Thanks. Call us about TMD treatment today!